I love reviewing guys like Bill Berends. What’s not to like? This is an instrumental album that focuses on Berends extraordinary guitar talent, and it rocks! You might be familiar with Bill Berends because of his work with a band called Mastermind. Mastermind started out as a very progressive rock project, and later evolved into more of a melodic metal excursion that landed their Insomnia LP on my Album of the Year list for 2010. Berends has taken to the streets without a band behind him this time out, and the results are still quite impressive. Anyone that has ever heard Berends play guitar doesn’t need to hear me rave on and on about how talented this guy is. Let’s just say it once right now, this guy is as good as they get. So, rather than continuing to reinforce what we already know, I’d like to draw attention to the different styles and sounds we get from the songs included on In My Dreams I Can Fly. The disc begins with the run-of-the-mill, Joe Satriani-like title cut. This is a well executed rocker, but not the most original piece of music you might hear on an instrumental guitar record. I liked this track, but I was hoping to get a lot more from a player of Berends caliber - and I did. “Rock-A-Rama” is more of a heavy groove oriented, “let it all hang out” rocker. We hear Berends playing up and down the fretboard, doing trills and even a little shredding. I see Berends as more of an artistic, tonal player than a shredder, but it’s great to hear him do it all. As the disc moves to a song called “Remember When,” we start to hear the sweet tone and passion in Berends playing. This is a piece of music that sings and cries out. With a fantastic drum part played by Jason Gianni, this is definitely the most passionate and emotional track on the disc. It’s always been obvious in Berends playing that guys like Clapton, Beck and McGlaughlin have been a big influence. And, even though the styles vary quite a bit from song to song here, we still get treated to Berends comfort zone occasionally. “Heavy Cream” is a song that rolls all those influences together. I’m pretty sure this is a homage to the legendary power trio of Clapton, Baker and Bruce. It has a dark and driven tone, with a smoother playing style reminiscent of someone like Jeff Beck. There are a couple of other nice tracks that follow in these same footsteps (“Paper Planes,” “Dream Rider”), having excellent melodies and smooth playing over groove heavy rhythm tracks. As you get further into this disc, you get treated to more great melodies that are set inside of these styles. “In A Quiet Place” almost has a 60’s Procol Harum feel, being a subdued song with Claptonesque tone and bending. “The Belvedere Bop” is more of the hard rock, Satriani style with excellent riffs and guitar acrobatics that will peel the paint off the walls. As you might expect with any player that has the talent of Berends, there are a few signature pieces here as well. “To Days Gone By” has a real band feel to it. There’s a nice bass line (played by Berends) going through this one, another excellent drum exhibition from Gianni, and some really great screaming guitar tone over a crunchy rhythm guitar track. It has Berends stamp all over it. We even get something totally different by way of “The Longest Winter” and the set closer, “The Long Road Home.” These two tracks have a bluesy edge that sets a certain mood. That mood becomes a living thing when the correct song execution is there. These two tracks more than any other on the record rely entirely on timing and feel for the respective song’s progression, and Berends plays each of them perfectly. “The Longest Winter” has amazing build up, and just might be my favorite song here. But, I think it’s “If Man Were Meant To Fly” that really turns my crank. This one has a great groove, a great opening riff, and it has a Trower-like tone and feel that finds its way to my heart every time. If you like instrumental guitar music, this is one you have to experience. One of the most surprising things about this record is the fact that Berends uses no pedals, which I find astonishing. As he says, “Pedals are for bicycles.” I’ve come across only a few independent instrumental guitar guys that really impress me - with Russ Hewitt and The Flyin’ Ryan Brothers being the best of them. 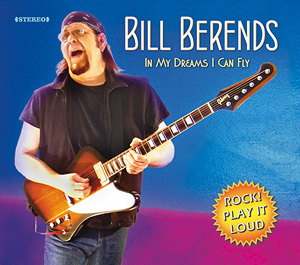 With this first solo album, In My Dreams I Can Fly, Bill Berends music demands to be included in that elite class. The album is also available via iTunes, CD Baby, and Amazon.